Encourage creativity with this wildly entertaining picture book mash-up from the minds of Jon Scieszka and Mac Barnett. Alex has been given a saccharine, sappy, silly-sweet picture book about Birthday Bunny that his grandma found at a garage sale. Alex isn’t interested—until he decides to make the book something he’d actually like to read. So he takes out his pencil, sharpens his creativity, and totally transforms the story! Birthday Bunny becomes Battle Bunny, and the rabbit’s innocent journey through the forest morphs into a supersecret mission to unleash an evil plan—a plan that only Alex can stop. Featuring layered, original artwork that emphasizes Alex’s additions, this dynamic exploration of creative storytelling is sure to engage and inspire. Mac Barnett is the author of the Brixton Brother series and several picture books, including Guess Again! and Chloe and the Lion (both illustrated by Adam Rex), and the New York Times bestseller Extra Yarn. He’s on the board of directors of 826LA, a nonprofit writing center, and founded the Echo Park Time Travel Mart, a convenience store for time travelers. Mac lives in Oakland, California. * "This deliciously subversive piece of metafiction skewers--with sharp wit and a sharper pencil--the earnest, purposeful literature so popular in the middle of the last century." * "This is a perfect book to give independent readers who are looking for something a little different. The unique layout and design will inspire creativity in readers." 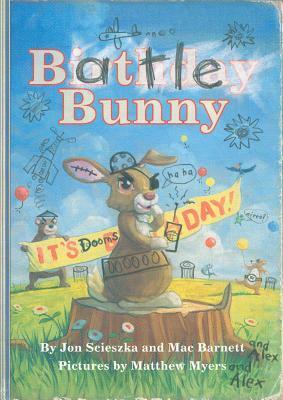 * "Battle Bunny makes for great entertainment: it's funny, the plot builds, and the protagonist captivates readers' attention. It also begs to be reread and shared. Kids will be eager to compare notes and to relive it with their friends." A “Best 2013 Books” in the Children’s Picture Book category! "This book says 'Welcome!' to children." * "The resulting text is thus an honest reflection of the ways kids interact with books—in a way that’s accessible to kids themselves—as well as a complexly layered work of comic genius." A "Best Book of 2013!"